Mayim Bialik anti-science: Follow-up on celebrities and science. 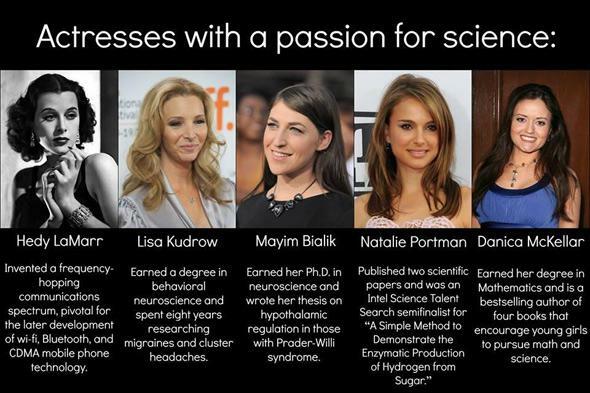 Late last week, I posted an article about Mayim Bialik and the issues of celebrities promoting science—specifically, including her in a picture of four other actresses who hold degrees or have published in scientific fields. In general, I like it when actors/writers/famous people take a shine to science. They’re in the public eye, and if they promote science, then that’s a Good Thing. But this can come at a cost, when the promoter in question may hold some anti-scientific beliefs. When they promote those as well, what to do? As I wrote at the time, what I try to do is applaud them when they’re right and point it out when they’re wrong. For the specific case of Bialik, this gets more complicated. She holds a degree in neuroscience, and is an enthusiastic supporter of getting more girls into science, technology, and math. That’s great! But she also supports a lot of what I would call anti-science. Her statements have made it clear she holds some anti-vaccination beliefs and promotes homeopathy, two stances I am very, very strongly against. In the end, I felt the good outweighed the bad, though, and said so. A lot of people agreed, a lot disagreed. Keith Kloor, for example, wrote an interesting piece on his Discover magazine blog Collide-a-Scape, pretty much agreeing with my premise (though he doesn’t really talk specifically about Bialik; he applies it to Dr. Oz). In the specific case of Mayim Bialik I have to disagree with Phil. I think the bad outweighs the good. Just the mere fact of an actor who is a neuroscientist is not that big a deal. Her views on vaccines and medicine in general, however, are extremely pernicious. In fact, her credentials as a scientist are a negative in this case because they mostly serve to lend weight to her antivaccine views. I would not promote her in any way, and I certainly would not do anything that could possibly lend the imprimatur of legitimacy to her views. I’ll admit I hadn’t considered that her credentials could be used by anti-vaxxers and the like to promote their incorrect (and dangerous) beliefs, and that gave me pause. Thinking that through, I have to say that does sway me; if she were promoting something like astrology, I’d probably just roll my eyes a bit and carry on. But these medical health issues are serious, and I’ve been very vocal for a very long time about vaccines and homeopathy. Because of that, I’ll be clear: I’ve changed my mind; given the opportunity again, I’d say using her as a science role model is not a net benefit. I’d have left her off the picture. Mind you, I’m talking about this one case where someone promoting science and/or rationality may have beliefs or opinions that bump up against the evidence*. There are many others, and both Steve and Kloor bring them up (including Bill Maher, Bill Nye, Richard Dawkins, and more). I’m not surprised. The main thrust of my article is that we all have things we believe that may not hold up to scrutiny. There’s a line attributed to Penn Jillette: “Everybody’s got a gris-gris.” Putting people up on a pedestal without reflection is a bad idea; feet of clay tend to crumble. Where we draw the line is an interesting and fruitful topic of discussion, and I imagine for many it will be a subjective judgment call. I will, however, disagree with Steve on one thing. I do think that an actor with an advanced science degree is remarkable, and it is reason to praise them (all other things being equal). Like it or not, a lot of people listen to celebrities (the word is a cognate of “celebrate”, after all), so when some of them are clearly pro-science, I’m happy to support them. On a case-by-case basis, of course. Correction (Dec. 23, 2014): Keith Kloor’s blog is on Discover magazine’s blog, not Discovery as originally written. * Update (Dec. 23, 2014 at 17:30 UTC): I rephrased this sentence to make it clear I was not talking specifically about the same issues as with Bialik; i.e. anti-vax and homeopathy.